So many companies rely on GBS labeling solutions. We don't mind being labeled. 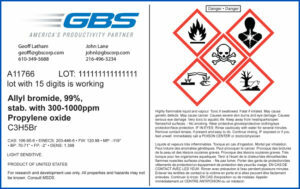 GBS has GHS Labeling Solutions. We have BS5609 certified solutions! Learn more about our GHS Compliance Labeling Solutions by selecting the above image. Contact us at 800.329.9434 to learn more about the GHS Compliance.